A few weeks ago, I was trying to diagnose a problem I was having with my 70 diesel. The pony motor (or starting engine to you purists!) clutch seemed to be in adjustment one day, and out the next. One evening during one of my sessions, the pony engine stalled or ran out of gas (I can’t remember which) just as my wife called to the shop to tell me that dinner was served. Well, I was cold, hungry and frustrated, so I dropped everything and hustled to the house. After a second helping of pork chops, I began to ruminate on just what might be the problem with that pony clutch. Seizing on a new idea, I grabbed my coat and headed back to the shop. The moment I walked in the door, terror struck! The red lamp on the dash was glowing ominously. In my haste to feed my face, I had left the ignition switch on, which for most battery ignition systems would just mean the battery would need a bit of a charge. But for a Pony distributor, it meant that those teeny, tiny, itsy, bitsy wires in one or both coils had been drawing current so long that the at least one, and probably both, coils were cooked to death. I grabbed my digital voltmeter and checked around a bit. My best guess was that both coils should be replaced—to the tune of $110/pair plus tax and shipping. As I was lamenting this tale to a good friend and JD mentor on the internet, I told him what I had needed was a sort of…timer! You know, something that if it saw a steady current, like that uninterrupted by ignition points and such, it would turn the power off to the distributor auto-magically. Well, we traded ideas until we came up with a pretty neat solution. Briefly, here’s what we came up with. It’s an oil pressure switch circuit that only allows current to the distributor if the pony is turning fast enough to generate around three to five pounds of oil pressure. We knew we would need a switch that had a normally open condition, which would then close as the pressure built. I did a quick search of the internet literature regarding fuel pump and oil pressure switches and instantly came across several articles written by antique car enthusiasts describing how electric fuel pumps could be retro-fitted to cars such as a Chevy Corvair. 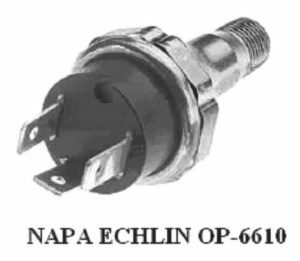 Most all of them referenced the same Echlin brand switch (OP-6610), available through NAPA. I stopped by my NAPA store and Mr. NAPA told me he could order me a switch and have it in the morning. He was able to tell me that it was a three to five-pound closing switch and that it had three terminals, one pair of terminals normally closed, one pair normally open. I ordered the switch (around $9) and headed home to scope out the project. 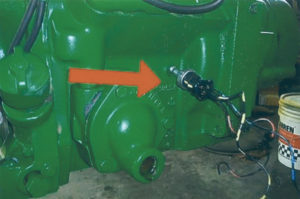 The Deere engineers must have known that I would need a source of oil pressure from the pony block, so they located a one-quarter inch pipe plug in the lower front of the block, near the joining of the engine and transmission. Now I’m here to tell ya, if you can reach in there and remove that plug and install another fitting, you’ve got some pretty small hands. This is the bad news for all you 70D owners. Late 720 and 730 owners are going to catch a break (more about this later on). I tried everything, including borrowing the neighbor’s grandson to try and reach the pipe plug, but nothing seemed to work. Then, as I was developing a repair strategy for the pony clutch, which was why this chain of events had been set into action anyway, I decided to bite the bullet, remove the pony engine from the tractor, repair the clutch and install my oil pressure switch. In the end, it was the right thing to do. After you have the pony lifted clear of the tractor, you just remove the pipe plug. The OP-6610 switch is also one-quarter inch pipe thread, so it will screw right into the block. A word of caution here. The switch, when installed, comes very close to the governor housing. You might want to install it via an elbow so that it is vertical, but it will work in any position. I also used a generic three-terminal headlamp repair plug (also at NAPA, PowerPath Brand #784811, about $2.99) that fit neatly on the switch. Then I ran three stranded #14 gauge wires up and through the wire guides on top of the pony. Be sure and label them as to which terminal they represent (“P,” “I” or “S”). The “P” terminal is the common terminal for Power input. The “S” terminal is the normally closed output and the “I” terminal is the normally open output. Now re-install the pony on the tractor. That was easy, huh? The real job took me about two hours, but I’m pretty slow and I was fussing with some other detail as I went. I’ve been working on refurbishing this old 70D for about a year and a half now, so this was a great time to finish all the dash wiring and make those headlights shine. The original wiring sent current from the switch through the resistor to the terminal on the distributor. When you moved the switch to “I,” the red dash indicator lamp glowed and the coils had juice. If you forgot and left the switch on, the coils soon began to overheat and eventually burnt out. The improved (coil protection) wiring using the oil pressure switch sends the current flow from the ignition switch through the resistor to the oil pressure switch terminal “P,” then to terminal “S” (normally closed when there is no oil pressure) and up to the red dash lamp. Terminal “I” will connect to the by-pass lug located on the starter switch (or it can go directly to the distributor—your choice). The original by-pass wire coming from the starter mounted foot switch will remain (that’s how the engine gets ignition power before oil pressure builds and closes the o/p switch contacts). I used crimp-type terminals and soldered them as well. I also installed about one inch of heat shrink tubing on each terminal so as to prevent the possibility of a short to the chassis. So, then came the moment of truth. Turn on the gas valve to the pony. You DO always turn off the gas and let the carburetor run dry, don’t you? If you don’t, you now might understand why your pony always acts flooded, the tank is most times dry and why the crankcase oil always looks mighty thin. When the dash switch is moved to “I,” the dash lamp should glow, just like on a car prior to cranking. If you placed a voltmeter on the distributor now, you would see no power at the coil terminal. Now begin the starting sequence, and as you engage the foot switch and the engine cranks for a bit, the red lamp should go out. 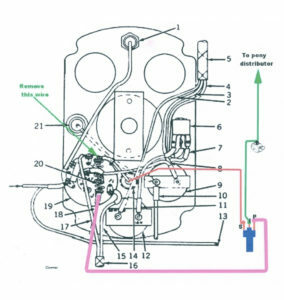 This indicates that the oil pressure switch has changed positions and is now routing power to the ignition resistor and on to the distributor. When the pony fires, and you remove your foot from the starter switch, the pony will continue to run because the o/p switch is closed and is routing power to the distributor. So you’re sitting pleasantly on the seat, letting the pony warm up for at least a few minutes. I know this seems like a long time, but it’s worth it to ensure pony longevity to give it a good warm-up. You could use this time to do a walk around of the tractor and look for things that might need attention later. In fact, you could safely leave the tractor to warm up and tend to other chores now. If the pony stops for some reason, like because you forgot to top off the tank, the worst that will happen is that the dash lamp will be glowing, but the coils will be cool. After you start the main diesel engine, you’ll shut off the gas and the pony will run for a few seconds and then die. As it dies, the oil pressure will fall off and the red dash lamp will glow again. Now move the switch to “OFF” or to a lights “On” position. If you forget to turn off the ignition switch, the red lamp will continue to glow, but the coils will be cool. As a secondary safety feature, this modification will shut down the pony if the oil pressures suddenly falls off, for any reason. Now I promised you late 720 (after serial number 72114900 and 730 owners) that you would catch a break on the installation. 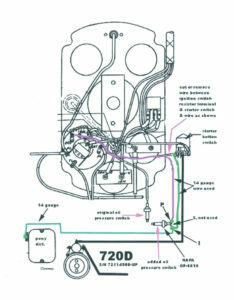 Since the late 720D/730D pony fuel circuit included an oil pressure line to operate the automatic fuel shut-off diaphragm, you have a ready source of live oil pressure right out in the open. Just remove the air cleaner or whatever else might be in the way and install the switch as described. You might have to select some different fittings to accomplish this—a one-eighth inch brass “street tee” works good—but I’ll leave this for you to decide. This ought to be a fairly simple one evening job. For the late 720D, you can use the same NAPA OP-6610 oil pressure switch but will only use two of the three terminals as the oil light is operated differently and the starter uses a push button instead of a pedal. It’s a simple operation once you pull the oil pressure line to the factory oil pressure gauge so the dash panel can be moved rearward to get to the wires. It also helps to pull the push button starter switch loose from the casting. The wire running from the ignition switch (res) terminal (opposite end of resistor from the oil light feed wire) to the starter push button terminal must be removed or cut then a 14 gauge wire run from the ignition switch (res) terminal to the (P) terminal of the added 6610 ops switch. A 14 gauge wire will then need to be run from the push button terminal where that wire was originally attached and hooked to the (I) terminal on the 6610. Another 14 gauge wire is then hooked to that same (I) terminal and run to the pony distributor power terminal. 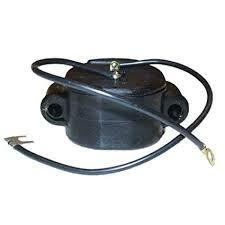 This keeps the by-pass circuit intact and allows full system voltage to the pony coils during cranking and resisted voltage during run, with the added benefit of engine shutdown if oil pressure should fail. The 730 diesel will be really close to the late 720 diesel, but we haven’t done one yet so it will take a little research to find the correct terminals to use. I hope this modification is helpful to you. It really works and frees me to perform other tasks while the pony warms up without fear of burning out coils. 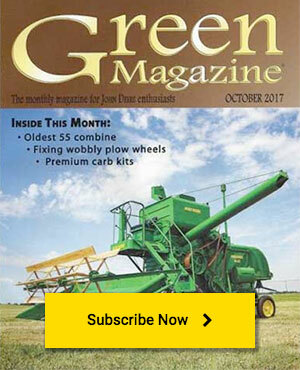 I really think if the Deere engineers had thought of this, they might have made it standard equipment! Next articleThis Pony is Alive!